As a home maker, not only me but everyone of us are on the look out for healthy wholesome foods for our family. Two such healthy foods that I have included in our daily diet are broccoli and kale. I generally make kale chips sprinkled with chilli powder and we enjoy it with our tea. And at times I saute them with some garlic powder and salt to have them in my salads but other than that I don't know other ways to cook kale. I know that they make excellent detox smoothies but I have never ventured in that area yet. 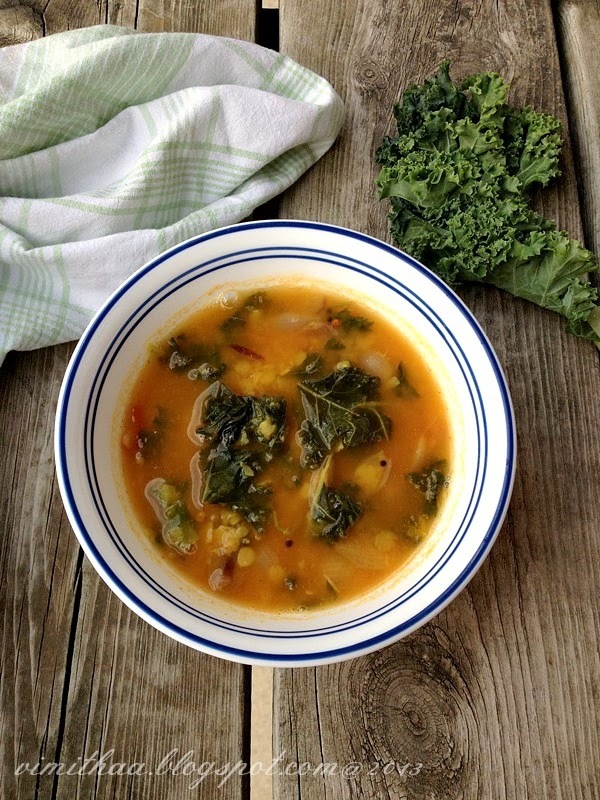 The thought of using kale to make Indian sambar was not something that I had planned. It all happened when I had only kale in my pantry to cook that night's dinner. Piping hot kale sambar with dosas made for a very healthy and satisfying dinner. Pressure cook the toor dhal with all the other ingredients under "pressure cook" for 5-6 whistles. Allow to cool and release the pressure. Mash with the back of a spoon. In a kadai, add the chopped kale, small onions, tomatoes and green chilli. Add water to immerse it and set it on medium flame. Allow to boil and cook till tender. Add the tamarind water and cook for 2-3 mins. Add the cooked dhal mixture to this and mix well. Add the sambar powder and mix well. Bring it to a boil and season with salt. Heat oil and ghee in a saucepan and temper with mustard seeds and curry leaves. Add the fenugreek seeds and fry till brown. Add in the sliced onions and saute till brown. Add the tempering to the sambar and mix well. 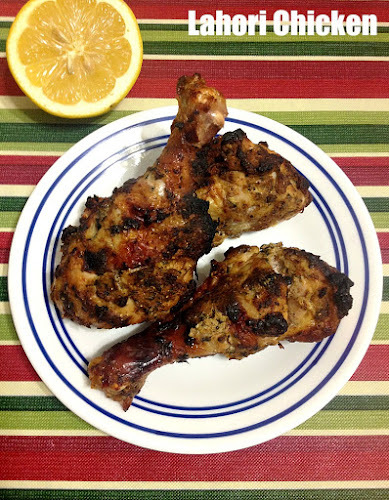 Serve with ghee soaked rice!!! very delicious sambar. a perfect comfort food. 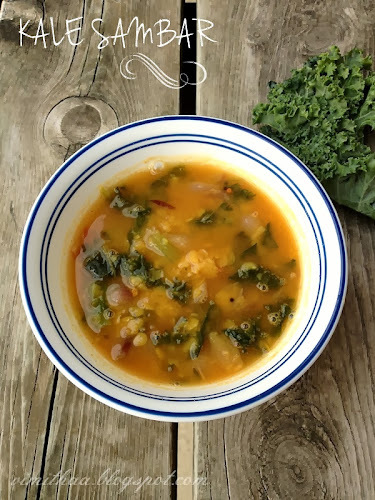 Wow Kale Sambar interesting.New to me.Will give a try. delicious finger licking kale sambar. Wow this is delicious V, nice innovation by adding the kale! 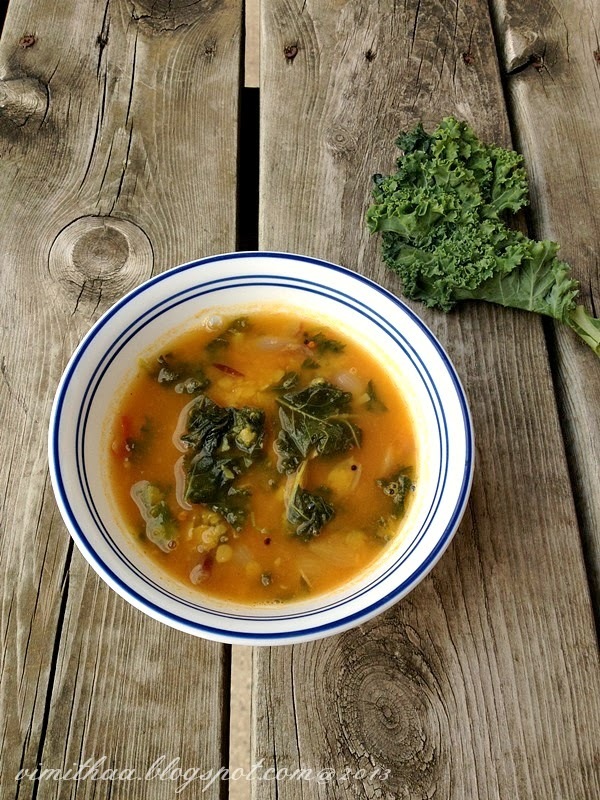 Great recipe Vimitha...I have tried making Kale molaguttal before. I will try this..Please visit my blog too whenever you find time..